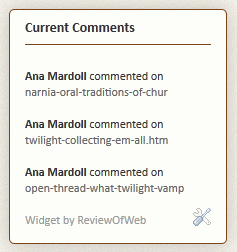 The widget may display between 1 and 25 "current comments". The deciding factor here is the 25 comments contained in the RSS blog feed page that the widget is loading. The widget may display less than 25 comments. The deciding factor here is comment density: if the last 25 comments on the blog were on a Twilight post, only 1 comment will show. The widget displays a piece of the web address title, and not the actual blogger title. This is a quirk of the RSS blog feed page and cannot be changed no matter how much it bugs me. The widget guts were recycled from a snipped posted by the ReviewOfWeb folks, credited in the widget, who are quite clearly also awesome. For those of you who use Blogger -- and I think this widget will only work with Blogger feeds, but I could be wrong -- here is the final code. Feel free to reuse. // Global array variable to control for post uniqueness. // Array function. Returns true when post already exists. // Set to 25 to process full feed. // Increment through each feed item. // Get post url to check for uniqueness. // If post has already been processed, skip to next in loop. // Limit substring to keep on one line. // Add checkurl to global array now that the post has been processed. Seriously. I was like Columbo today: "Just one more thing, please?" Do the current comments seem to be jammed for anyone else? I think it hasn't updated in 20 hours or so. That's not accurate anymore, it was 20 hours ago. I'm worried that it might have something to do with me, I noticed it starting to be weird around the time Ana fixed a post I borked a post in the Narnia thread. I thought that it sorted itself out when it stopped saying that was the most recent post, but now it seems to be jammed again.